Leading Manufacturer of white ceramic board, magnetic white board, non magnetic white board, kids double side board and messenger white board from Ahmedabad. White Ceramic Board matt fused on steel surface is passed through various stages of treatment. Ceramic surface pleasures silky smooth writing. Higher & superior quality range of writing boards with a lifetime warranty on the surface under daily use. Semi-Matte Surface can be used as OHP screens. Available in white color for writing with markers & Green color for writing with chalks. Available in all sizes and can be customized also. 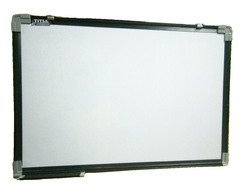 Our company specializes in offering qualitative range of Magnetic White Board. 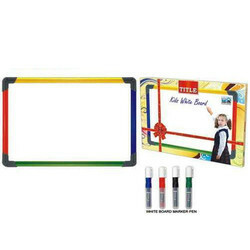 This range of chalk blackboards is ideally used in schools, colleges, coaching classes as well as other educational institutions. Additionally, the offered range is available in different specifications with respect to the divers & emerging demands of the patrons. 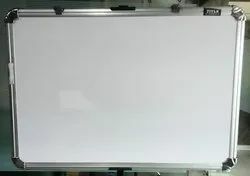 We are offering Non Magnetic White Board to our clients. Non-Magnetic Green Board offered feature wall mounted aluminum frame as well as in non-magnetic green board finish which makes them environment friendly in terms of usage. Further, these are also easy to write and wipe off which make these highly demanded in the market. Some of its features include provides for longer service life, low reflectance that assures of clear visibility, comes with mounting accessories support, choice of difference size and styles, can be offered in OEM specifications. We are glad to introduce ourselves as a reckoned name in trading and distributing a wide range of Kids White Boards. Our deft vendors ensure to develop these products in standardized and customized forms in accordance with the emerging and diverse requirements of the customers. 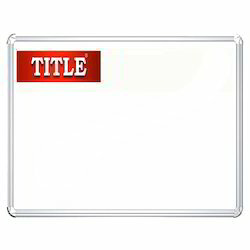 We are offering Messenger White Board to our clients. Packaging Details: Four colour Packing in a single box. Outer case is 10 Nos. 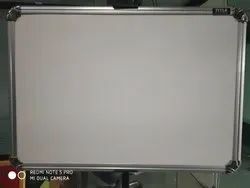 Looking for White Board ?